Don’t miss out on a visit to the weekly market in Merano during your holiday at the charming Dolce Vita Hotels in South Tyrol. You can sample regional South Tyrolean and Italian delicacies to your heart’s content. The latest in Italian fashion is also available at the weekly market. Get your own impressions of the tasty regional products and delicacies from South Tyrol and take a stroll across the weekly market in Merano. There is always something interesting during the weekly market of the beautiful spa town Merano. A wide range of cheeses and bacon, Mediterranean fruits and vegetables, finest South Tyrolean wines and much more is offered by traders, marketers and farmers from the surrounding area at the weekly market in Merano, near the holiday destinations Naturns and Latsch. A friendly word here, a nice chat there – the South Tyrolean charm is everywhere at the weekly market in Merano. Sampling one or the other speciality will without a doubt convince you about the quality of the local products. Weekly markets like the one in Merano have a long tradition in South Tyrol. This is when the locals meet to buy fresh fruit and vegetables and to exchange the latest news. Apart from the regional delicacies, clothes and household goods are also offered. A many a bargain can be had at the weekly market in Merano. 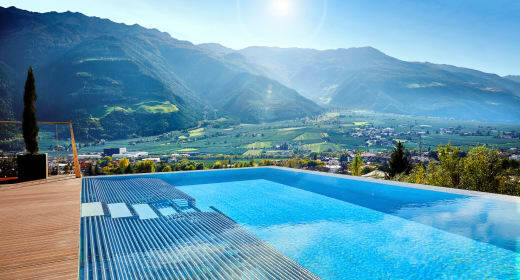 Naturns and Latsch are only 13 kilometres away from Merano – a stone’s throw away for active holidaymakers at the Dolce Vita Hotels. The wonderful weekly market in Merano is reached by bicycle or Dolce Vespa in a very short time.